Gated driveway with parking for two vehicles (additional parking available on the street directly outside of the villa). The front door to the upper floor accommodation is accessed via a shaded porch directly from the driveway and additionally stairs from the driveway lead down to the pool and gardens. Entering the villa through the front door leads into a large open-plan living room with comfortable sofas and modern glass dining table. This living room leads on through an archway to a very modern kitchen with granite work surfaces and all modern appliances including hob, oven, dishwasher, washing machine, fridge-freezer, microwave and coffee machine. Double patio doors from the living area lead out onto a lovely shaded terrace that has comfortable rattan chairs at one end and a dining table and chairs at the other end. All hallway leads to the three upper-floor bedrooms, the master bedroom is very well presented with en-suite bathroom (with marble sink unit, toilet and shower). The second bedroom features twin single beds (that can also be pushed together to form the equivalent of a super-king size 6ft bed). The third bedroom on this floor again has twin single beds and again is comfortably furnished. The large family bathroom has a separate bath, walk in shower, sink unit and toilet. A spiral staircase from the living area leads to the lower floor accommodation, the second lounge on the lower floor is spacious with comfortable sofas and an LED TV with a good selection of British Satellite channels. Double doors from the living area lead into a lovely double bedroom and a small corridor leads into the fifth bedroom which features twin single beds. All of the bedrooms feature air conditioning and WiFi access is available throughout the villa. Doors from the downstairs lounge lead out onto a fabulous shaded dining area with brick built dining table with tall bar stools to seat 10 guests (whilst overlooking the pool). The pool area features an 8m x 4m private pool, mature shrubs and a separate large terrace. 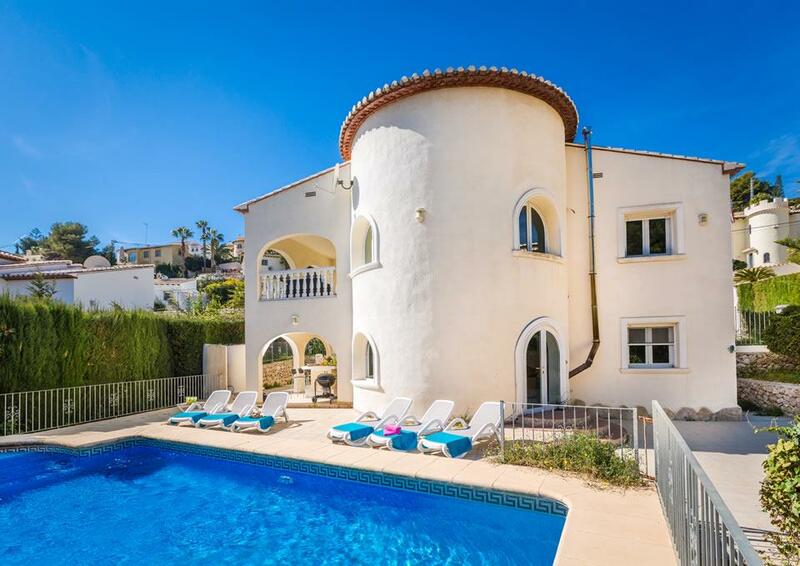 In addition there is a chidren's play area to the side of the villa on the upper level with astro-turf, climbing frame with slide and football goal.